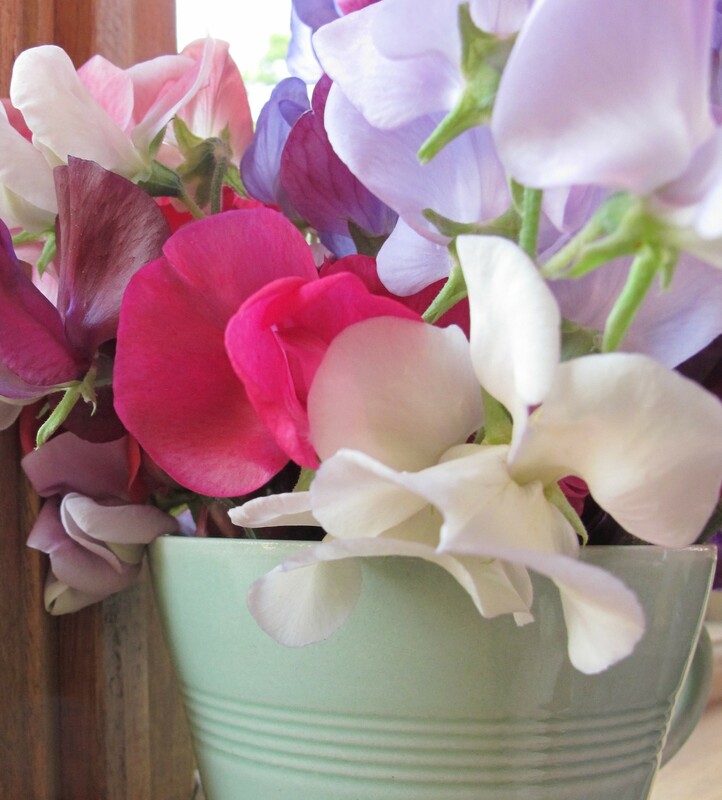 Sweet pea season is in full swing here. 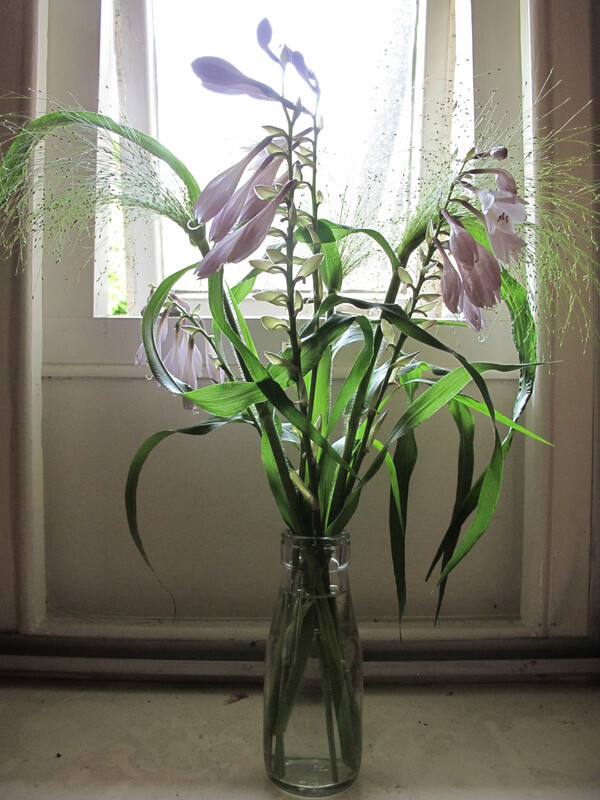 Every room in the house has a fistful stuffed into any vase, jar or bottle we can find. 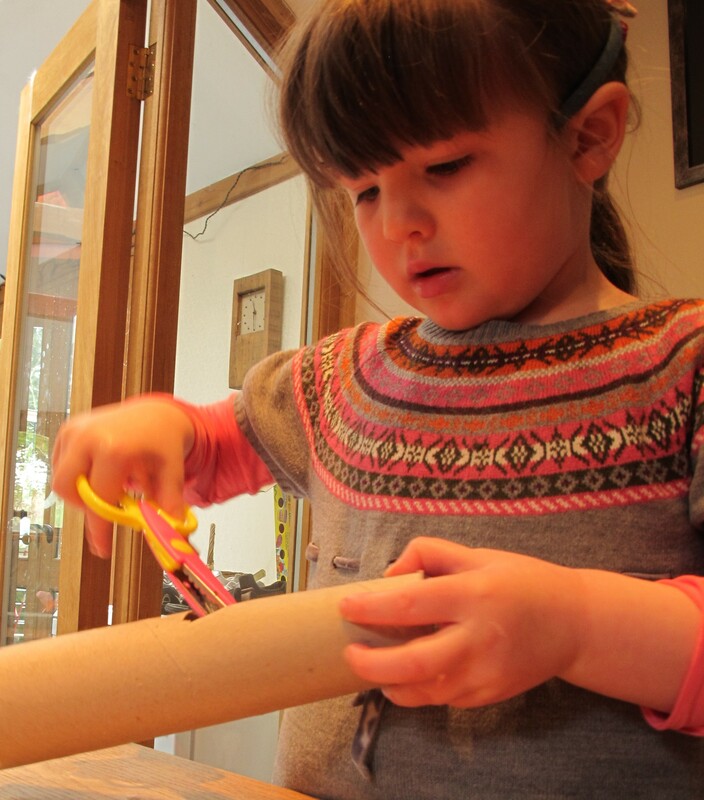 Here are a few things I’ve accidentally learnt about the scented scramblers this year. We’re overrun with lavender Lady Grisel Hamilton and pale pink Nelly Viner. 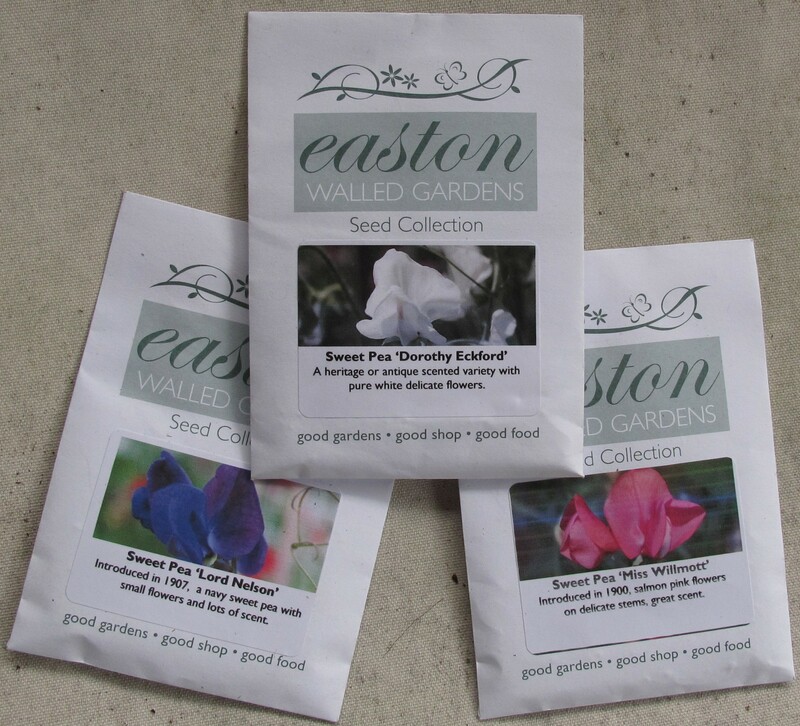 I only sowed one pack of each but they had the best germination rate of all the varieties we’ve grown. The secret? 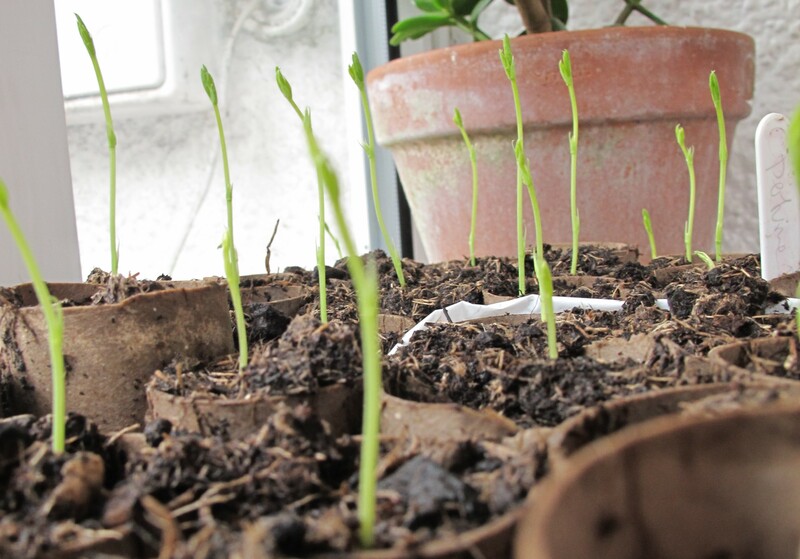 I popped the seeds into water one Friday night, intending to sow them the next afternoon. But my daughter had swimming, then we met up with one of her buddies… I finally remembered them on the Monday morning, and found them looking fat and bloated. 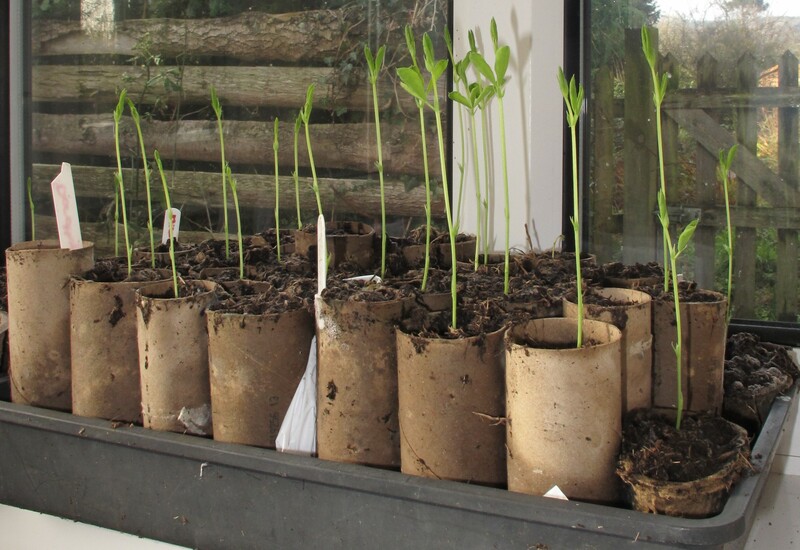 They were swiftly transferred to damp kitchen towel and when I got round to planting them the following weekend most of them were sprouting. 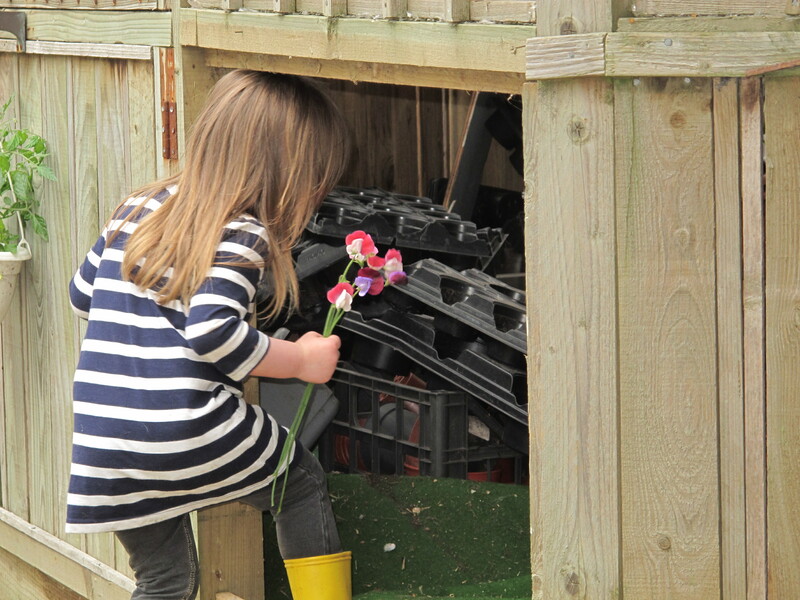 We had a 100% success rate with these – they all grew into strong, healthy plants. Usually I’m lucky if 50% germinate and survive long enough to be planted out. Semi-disaster struck in April when a passing wild rabbit feasted on the seedlings from our first sowing last November. They looked like they might be goners but I planted them out anyway and they’ve recovered well enough. Their roots were far more established than the ones we sowed later, so I think they could have survived almost anything. My neglect of Nelly Viner and Lady Grisel Hamilton continued once they were growing. Instead of pinching out their tips – as I thought you were supposed to – I let them grow long and leggy. They tangled so much that I had to spend ten minutes teasing them apart before planting them out. 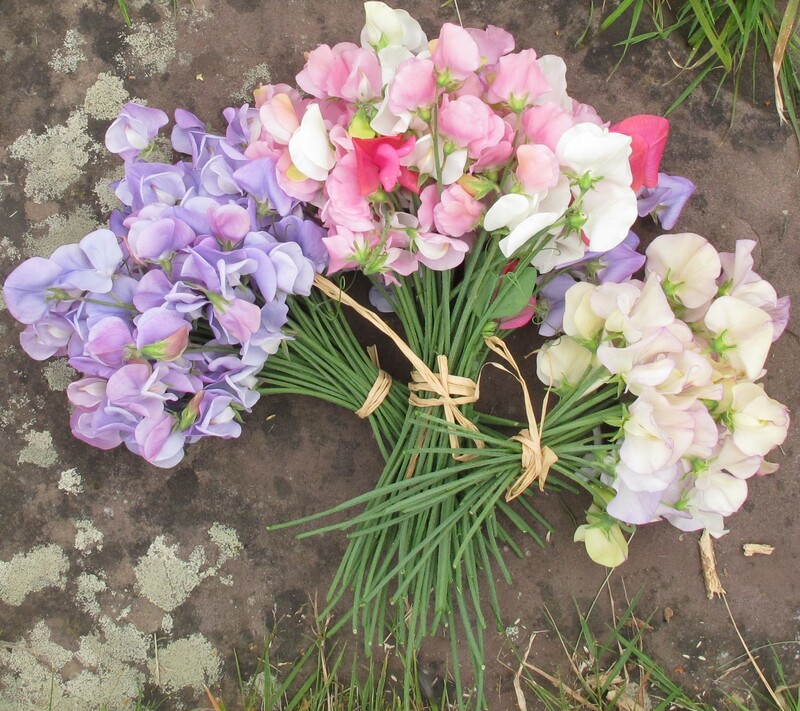 But they’ve gone on to produce long, strong-stemmed flowers that are perfect for picking. 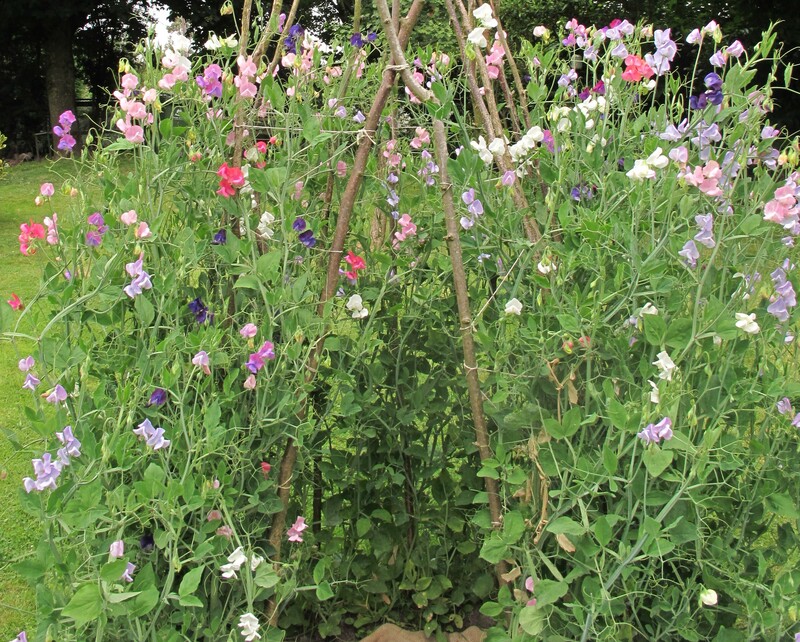 According to Gardeners World this is the best way to grow sweet peas for the vase – and if you can be bothered to pinch out their side shoots they’ll be even better. 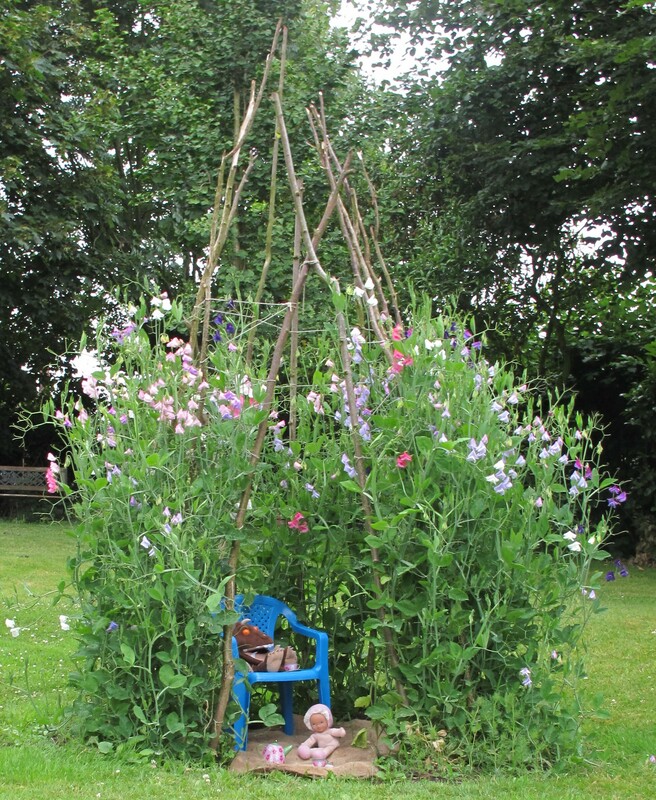 Our daughter’s sweet pea castle was only meant to be a bit of fun. But it’s become one of the loveliest features of the garden this summer. 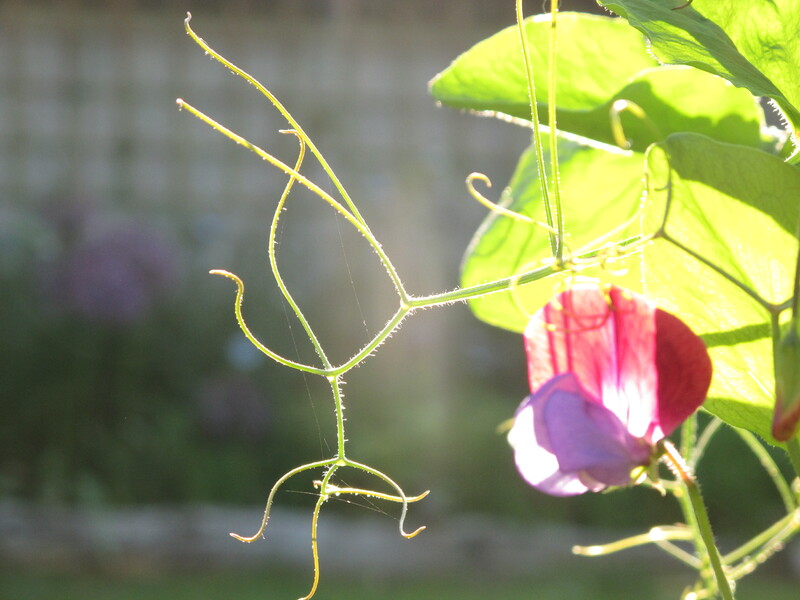 However, the ones we planted in smaller wigwams are top-heavy and so congested that the flower stems grow twisted and misshapen as they try to find their way towards the light. …the wigwam shapes generally advocated are not ideal. All the growth generated from the bottom ends up concentrated at a thin area at the top. 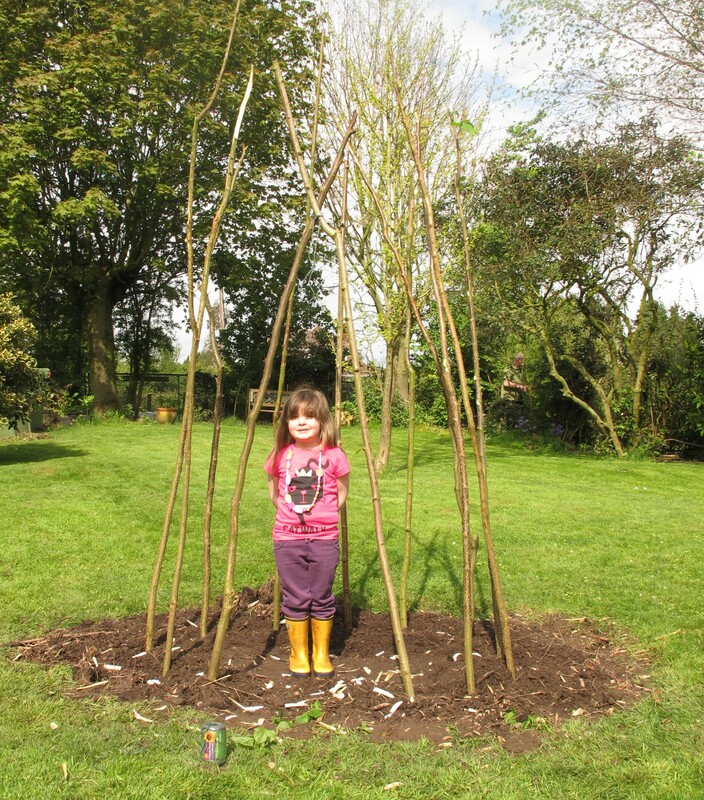 Stakes with a coarse netting (such as pig), set into the ground in a circle (perhaps 500mm/20in wide and 1.2m/4ft high) are better; or use bushy twigs of hazel or birch as pea sticks – anything with long stubble to cling on to. 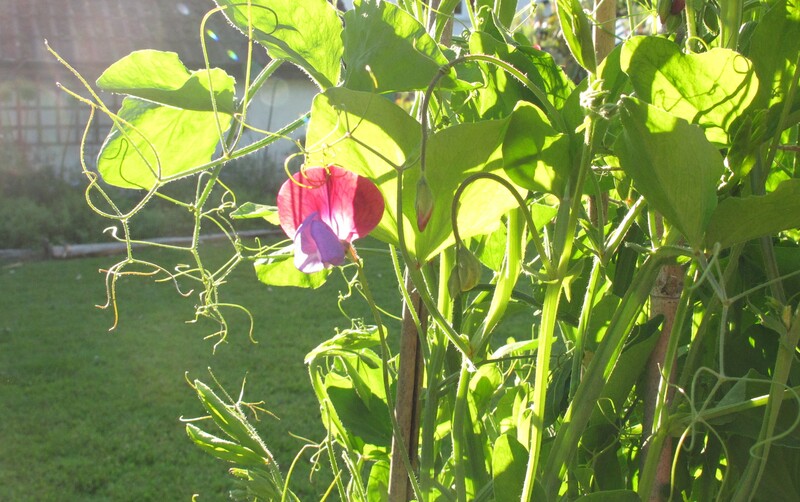 So it seems that most of the so-called rules of sweet pea growing are there to be broken. I’m beginning to wonder if most gardeners make it up as they go along, just like we do. 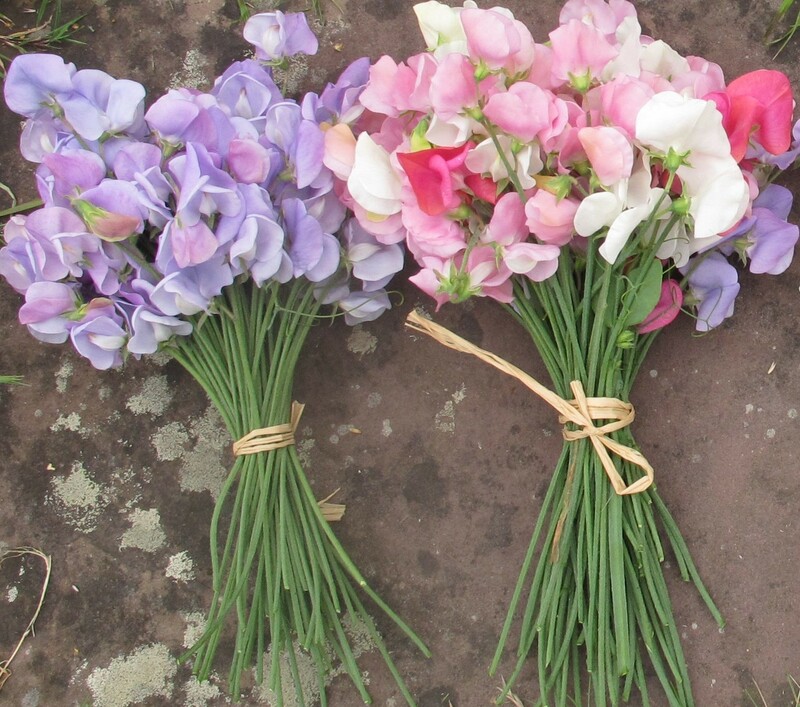 It has been all about the sweet peas this month. If they were’t so lovely, I’d almost say picking them has become a bit of a chore. Our pastel-pink-and-white painted ladies are the most prolific. I adore the more vibrant purples and reds as well as the pure whites, but we have far fewer of them. 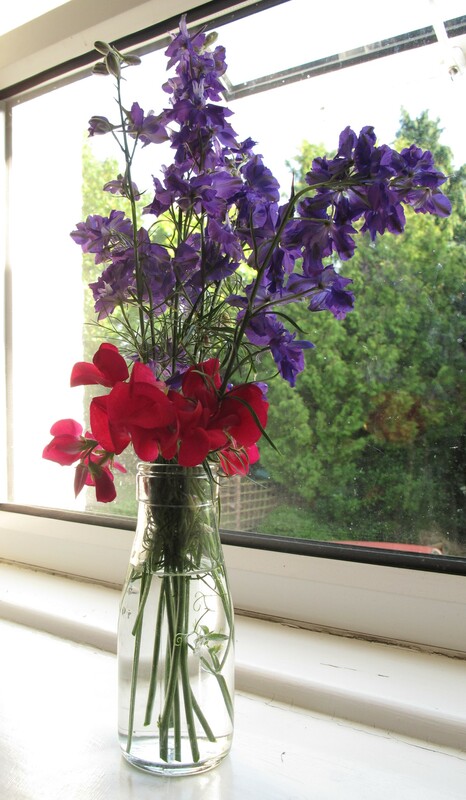 Over the past couple of weeks many of the sweet peas have had very short stems – just a couple of inches. I wonder if the hot weather is bringing them on too quickly. But what they lack in length they make up for in abundance. Anyone who comes to visit walks away with a fistful. And since most of them are too short for vases, I have scoured the cupboards for squat cups and glasses to put them in. 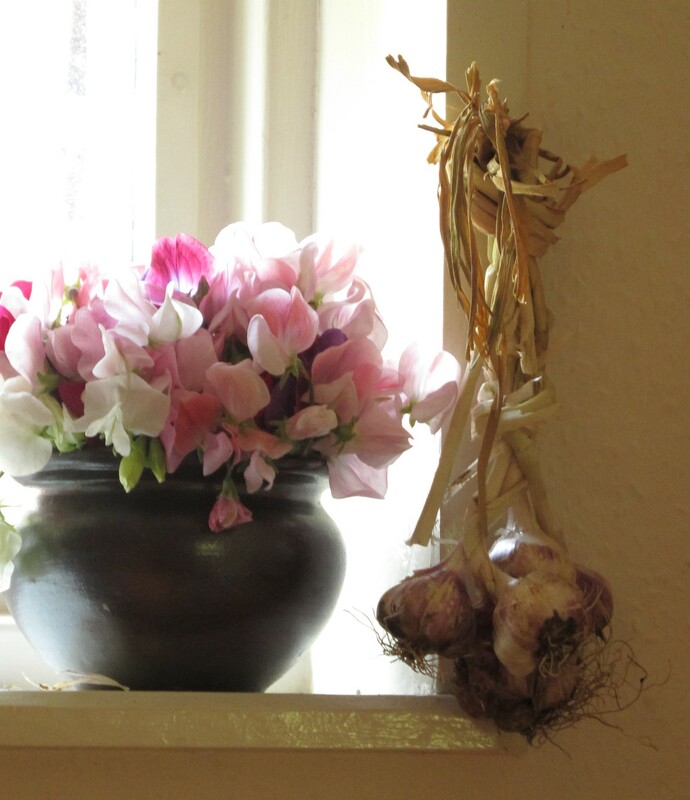 Most of these flowers – and the garlic – were from Sarah Raven and Pennard Plants seeds and sets. 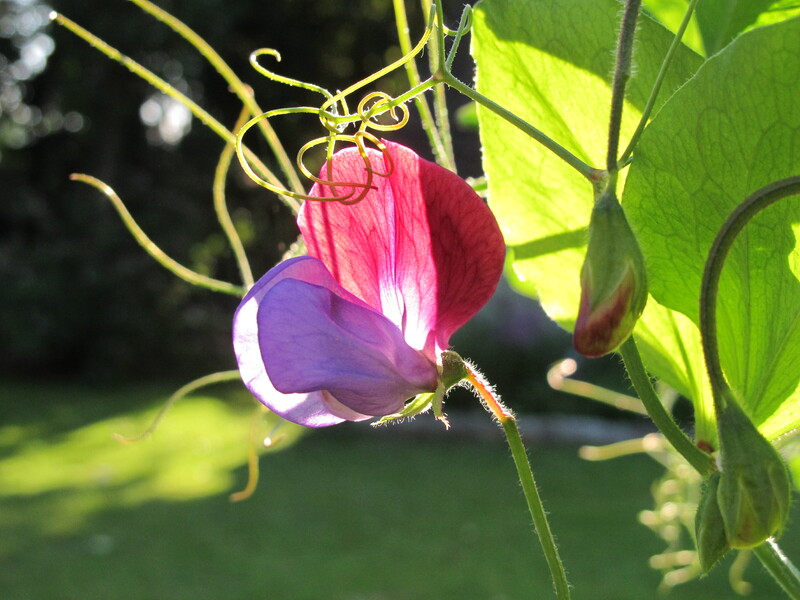 Last spring I sowed sweet peas direct into the ground, and got a big fat nothing. Then I read an article by Monty Don saying he doesn’t have much success that way either. So I decided to try again, sowing them in pots to plant out later. 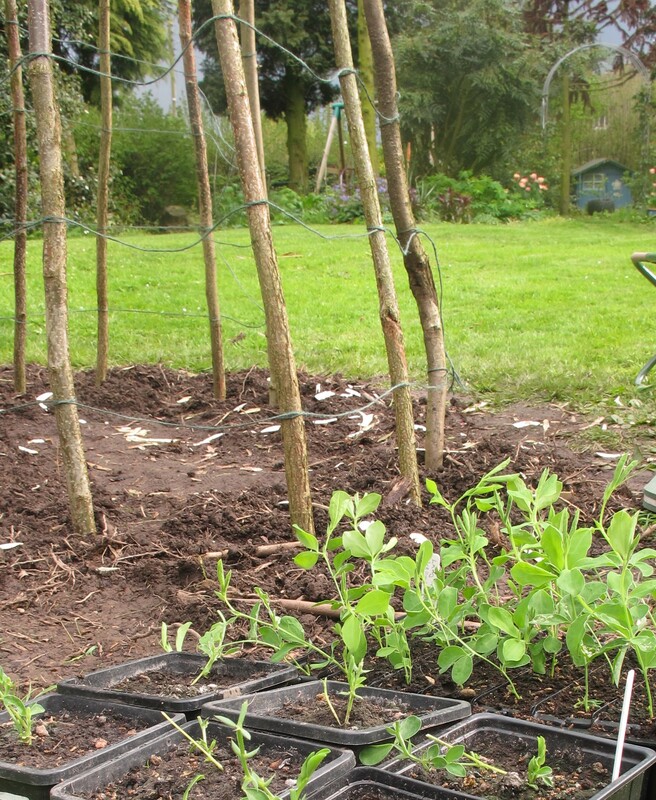 At the Malvern Autumn Show I came across Pennard Plants – a fab company specialising in heirloom seeds. After rifling through their collection I finally settled on a couple of old-fashioned varieties. One of which was Cupani. 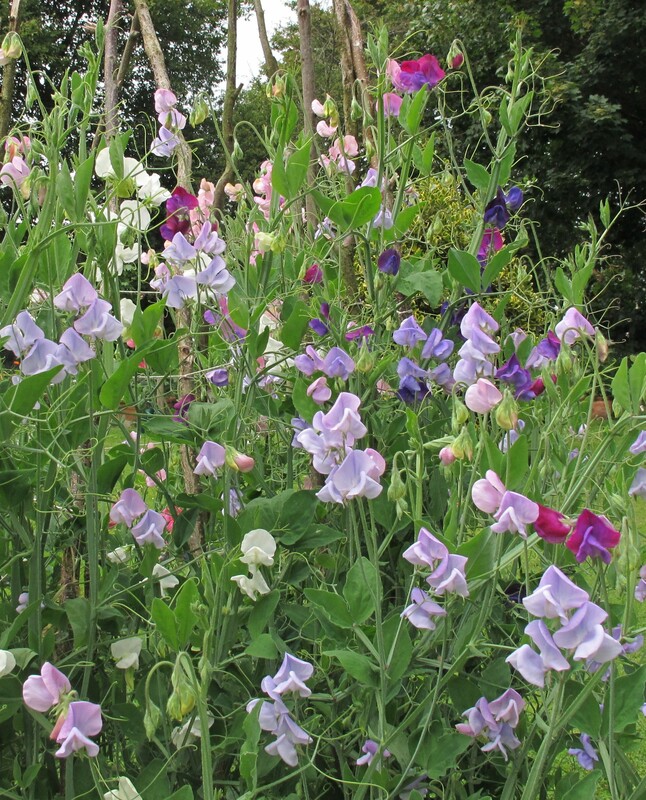 This is officially ‘the mother of all sweet peas’. It can be traced back to 1699 when it was cultivated by an English schoolmaster from seeds sent to him by Father Cupani, a Sicilian Monk. 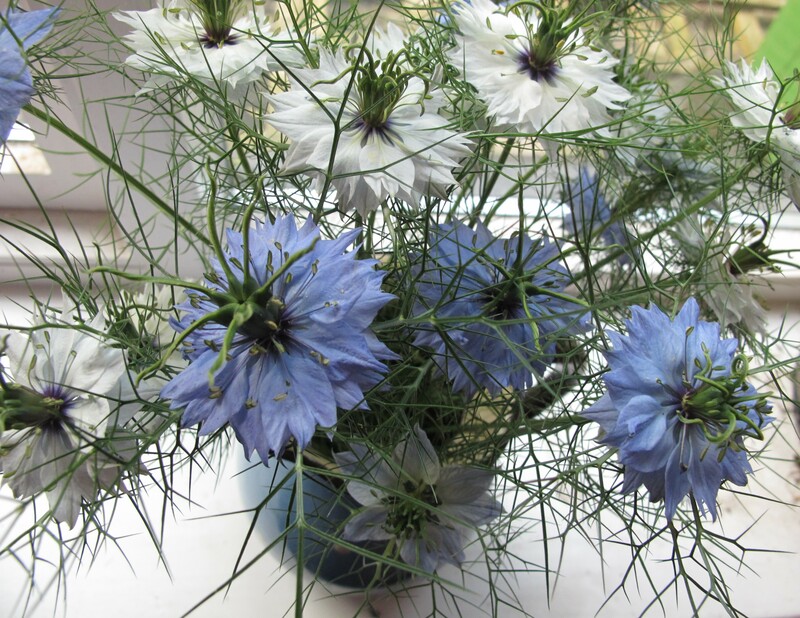 I had 15 Cupani seeds and sowed them in three batches: autumn, winter and early spring. 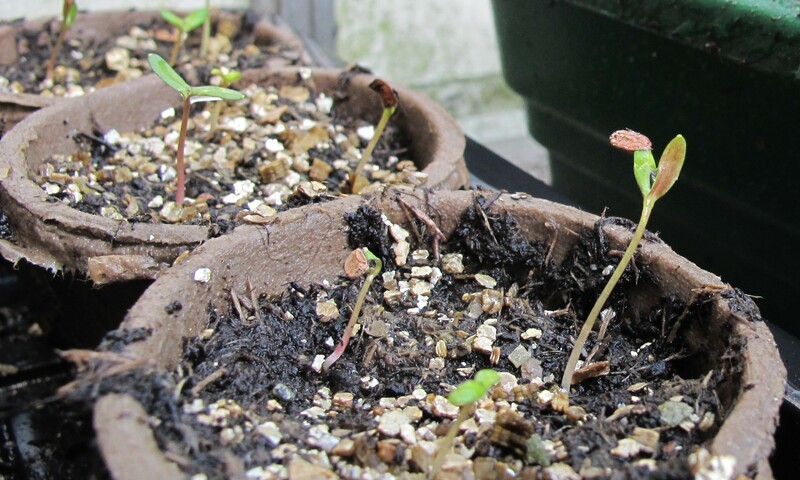 Then I left them to germinate in the well ventilated (i.e. 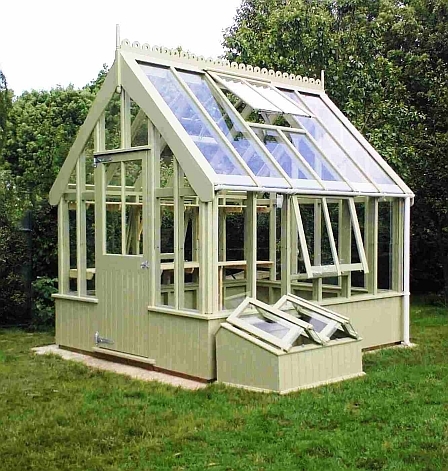 several panes of glass missing) greenhouse we inherited with the cottage. Predictably, the first batch were devoured by mice as soon as they germinated. The second batch grew and made it through the winter, but looked pretty shabby by February. The ones I sowed in the spring caught up quickly as the weather warmed. I won’t bother with a winter sowing again. 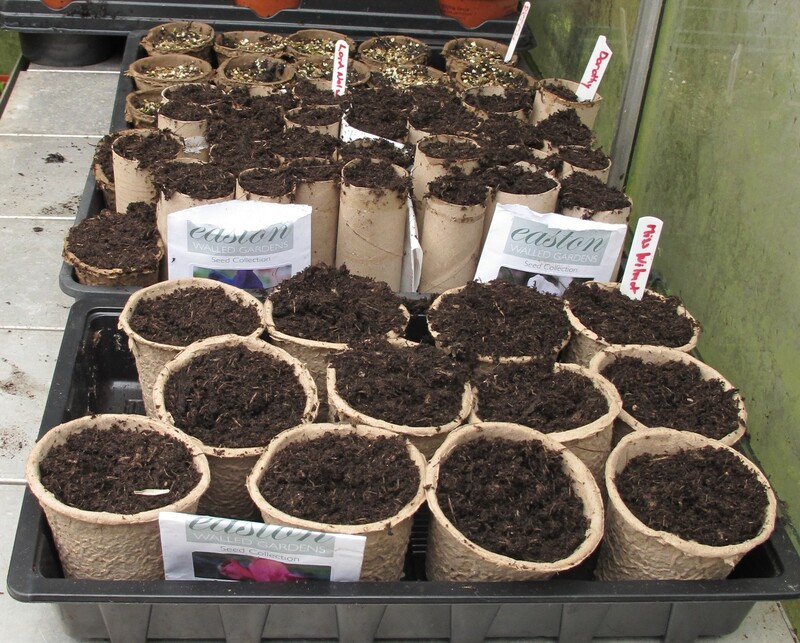 We planted them out in large containers and they are rampant – you can’t tell which were the spring / winter sowings now. I mixed Cupani with another heritage variety, Painted Lady. Apparently she is the daughter of Cupani – but that was a happy accident, I didn’t know it at the time! They have started flowering in earnest this week. And the more you pick, the more they flower. 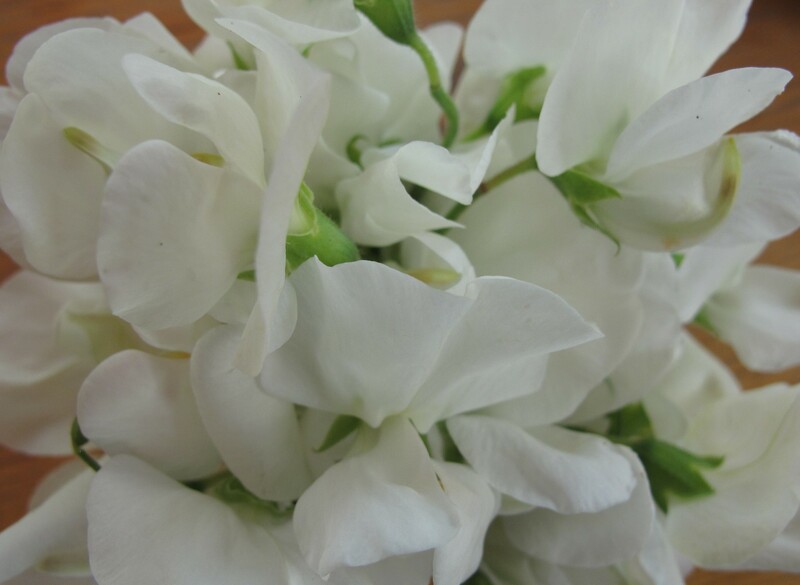 Hopefully we’ll have that inimitable sweet pea fragrance in the house all summer long. 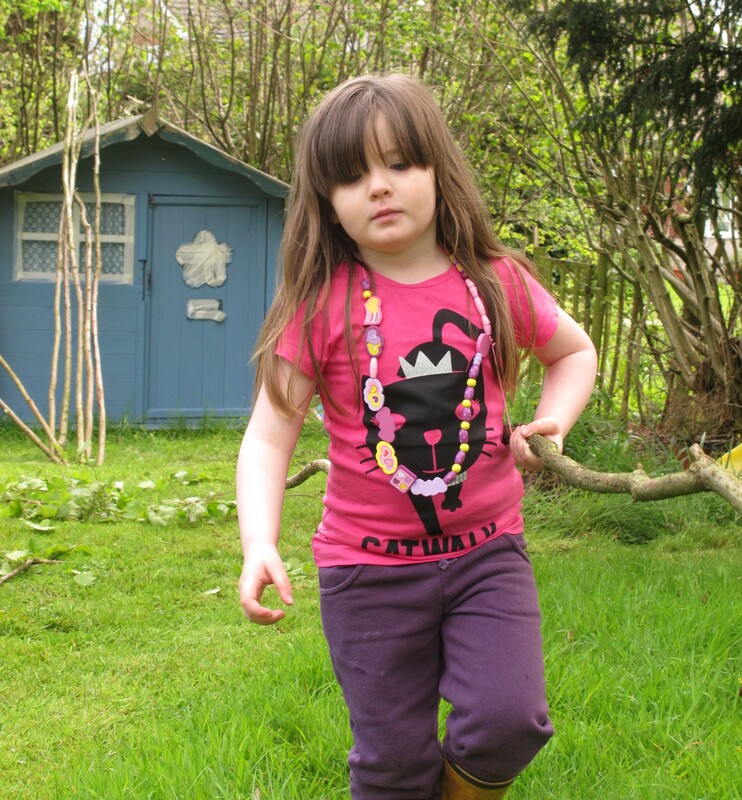 they are rampant – and I think we have over-planted. Our neighbour has grown them for years and says ‘more than one plant per stick is greedy’!